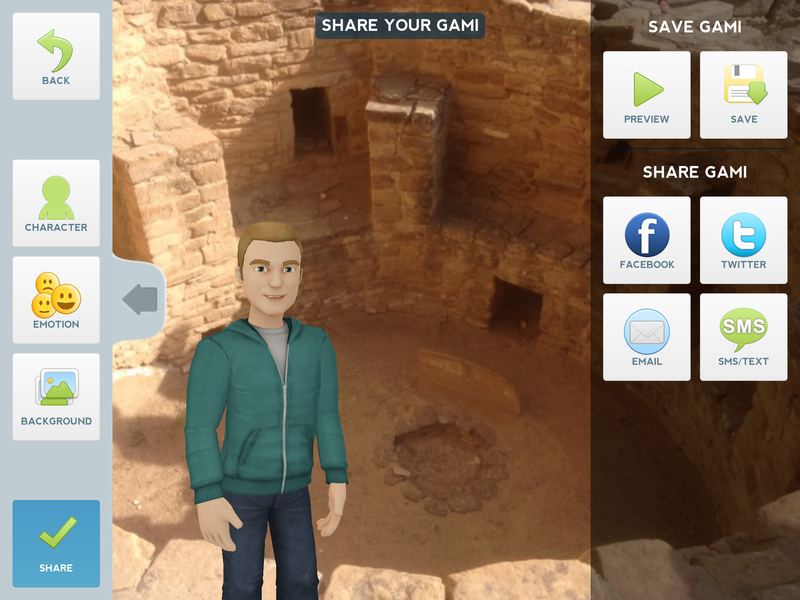 Tellagami- Tell ’em What You Know! 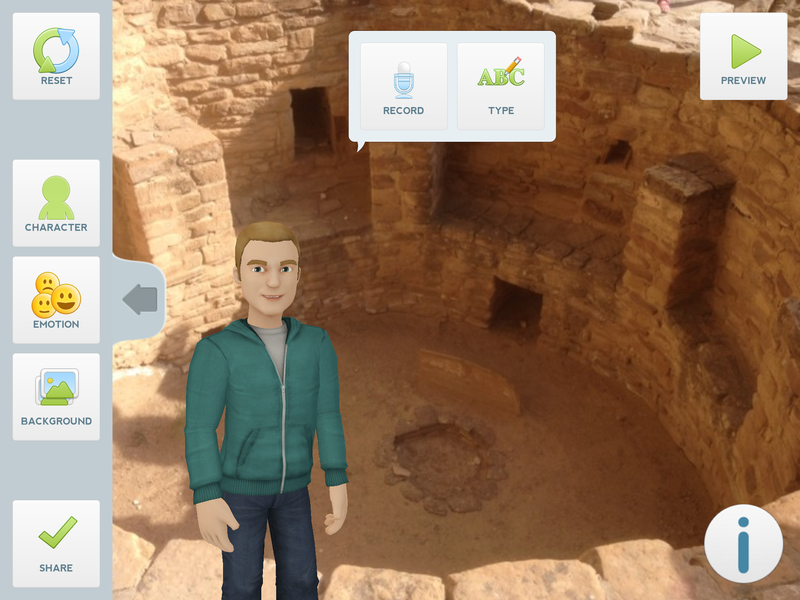 My wife Jennifer, @jwagner_wagner, introduced me to a new app a couple weeks back that I have had a great time playing with called Tellagami. It is FREE…which is something we all love. 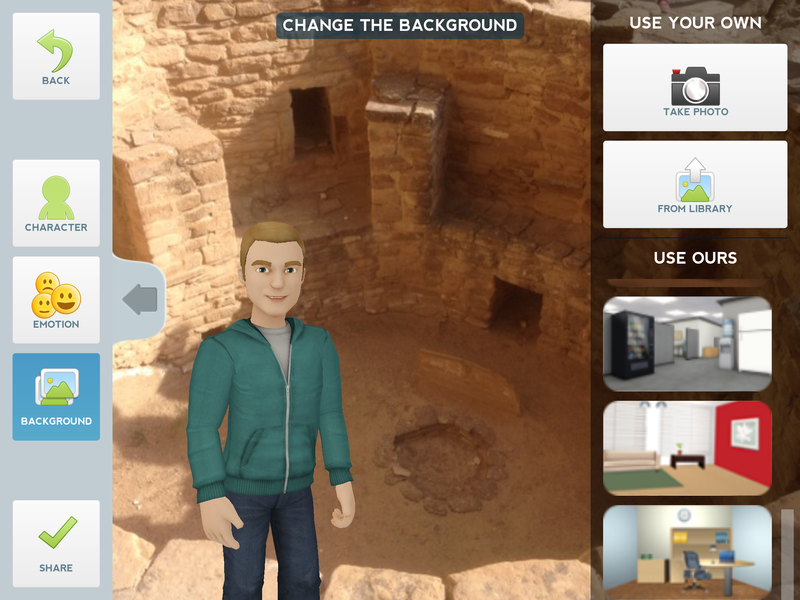 Tellagami is an app that allows you to create a 30 second clip to share information with others. 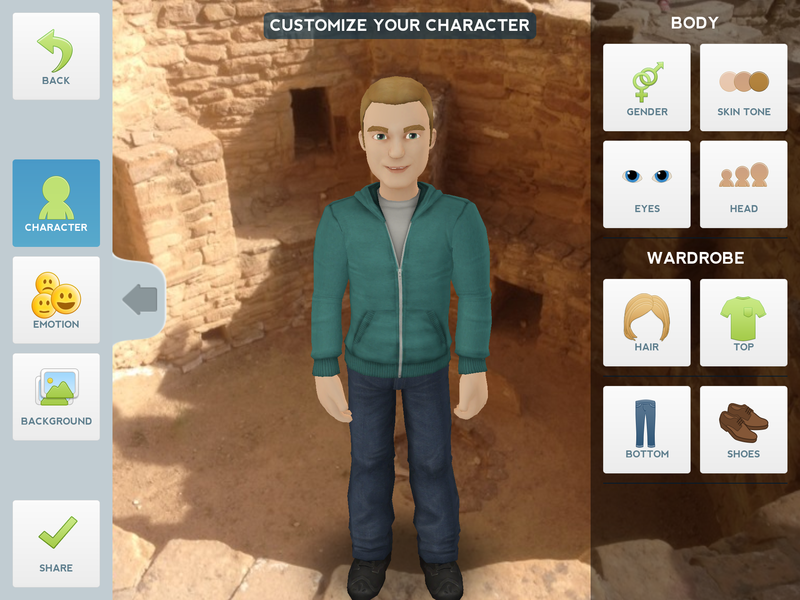 You design an avatar-like character, add a background, then type in the text or record your own voice to share the knowledge you want. Here is how it works. I start by creating a character. It defaults to a female with a nature background. Click on “Character” to change the gender, skin tone, eyes, head size, and wardrobe. 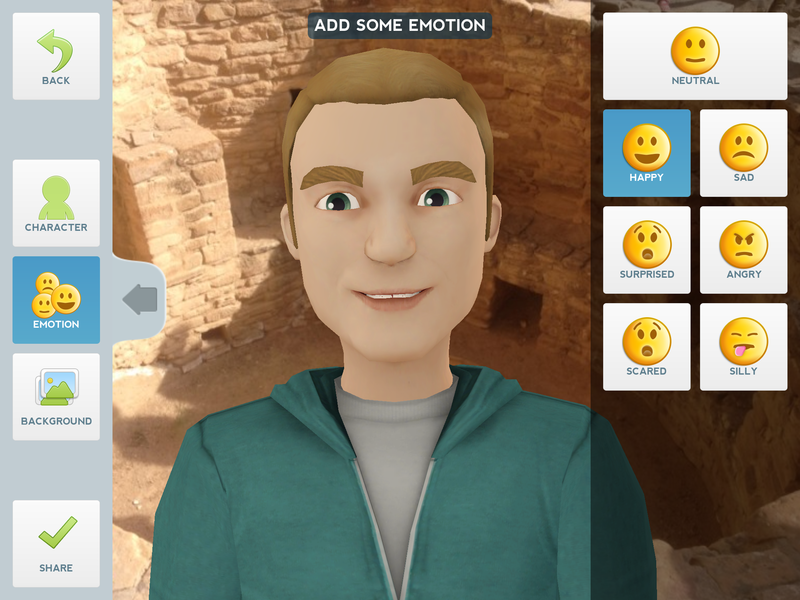 I can add “Emotion” to my character by choosing a facial expression. I can match the feeling of the information with the look on my character’s face. Next I select the”Background”. I have the option to choose from a set of background images supplied by the app or use the camera roll on the device to import my own image. The character will default to the middle of the screen. I can use two fingers to make the character bigger or smaller. I can also drag the character around to screen to find an area that is least intrusive with my background. Note that the character will have gestures added to it while he/she is speaking. I am now ready to record. A hint: The recording options appear first. Clicking on another option, like “Character”, will open that menu. Click on “Character” again to get back to the recording options. I have two options to record. I can type in a script, then choose from a number of default voices supplied by the app to read it for me, or I can record my own voice to be included in the video. For you and your students, select what will be most comfortable for the situation. Remember that you have 30 seconds. Even if you are recording your own voice, it is wise to write down what you are going to say and practice a few times. If you are not happy with your recording you can try again. Press record a second time…it erases the last try and starts again. Once I am happy with the results, I have the option to save to the camera roll and/or share via Facebook, Twitter, email, or text. Check out my Gami on Kiva’s here! I can just imagine how much fun students will have creating a quick book review, explaining a math problem, or recalling a time in history. What will your kids share? I can’t get it to save to my cameras roll!, It saves, but I don’t know where it’s going! I am not sure where else it would save. Maybe to iCloud? Check your camera roll and photos (flower app). If they aren’t there I guess I would either contact Tellagami or uninstall and re-install the app. Sorry you are having trouble.